As we love the lave, we might recall that it was on this date in 1939 that The Viking Press published John Steinbeck’s The Grapes of Wrath. 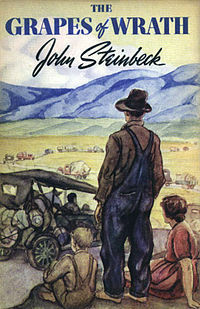 The story of the Joads, a poor family of tenant farmers driven from their Oklahoma home by economic hardship– drought, agricultural industry changes, and bank foreclosures forcing tenant farmers out of work– it won the National Book Award and Pulitzer Prize for fiction, and was cited prominently when Steinbeck was awarded the Nobel Prize for Literature in 1962. In a world full of smartphone payments and cryptocurrency, 85% of all transactions are still done in cash. 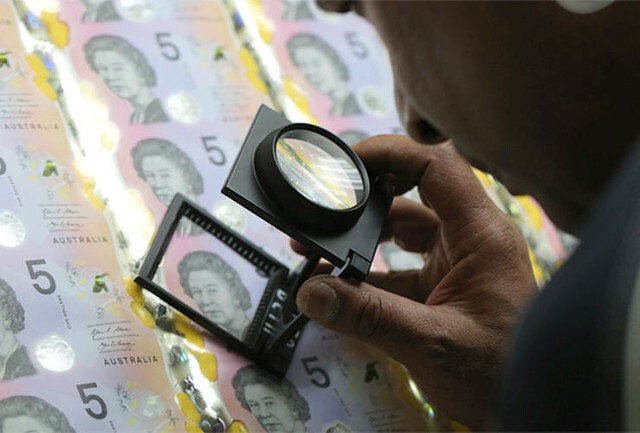 Australia actually sees cash demand rising at a steady 6% to 7% per year with no decline on the horizon. As we bite our coins, we might recall that it was on this date in 1789 that President George Washington named Alexander Hamilton as the first U.S. Secretary of the Treasury. 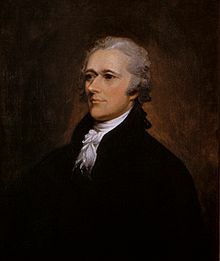 A founding Father, Hamilton created the Federalist Party, the world’s first voter-based political party, the the United States Coast Guard, and the The New York Post newspaper. As Treasury Secretary Hamilton stabilized the nation’s economy and paid back the mountainous debt resulting from the Revolutionary War. He established the first national bank and created the U.S. Mint in (the precursor of) the form in which we know it today. In 1858, the United States was an industrializing nation with a banking system stuck in frontier times… Heated battles over ‘the money question’ came to dominate the country’s politics, but no matter how unsatisfied the people, any solution that tended toward centralization was, due to the prevailing prejudice, off the table. 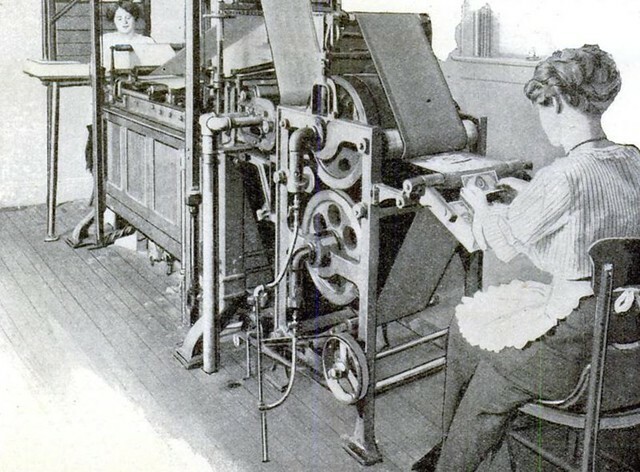 And therein hangs a terrific tale, “Printing Money,” an excerpt from America’s Bank: The Epic Struggle to Create the Federal Reserve in the always worthy Delancey Street; read it here. 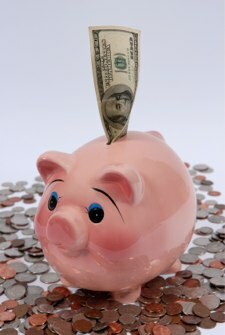 As we bite our coins, we might recall that it was on this date in 1982 that money market deposit accounts were first offered by banks and S&Ls across the U.S. Pioneered in the early 70s by brokerage houses, the accounts were a way around the Regulation Q prohibition on interest payments n demand accounts. Each individually numbered bill is lovingly stitched by our robot Behemoth, which labors for over eight continuous hours at up to 1500 stitches per minute. Slowed down by the many twists and turns of the design, along with thread breaks, bobbin changes, and mysterious mishaps, each bill takes about two days to stitch. Nonetheless we achieve a pattern far more complex than any commercially available quilt. 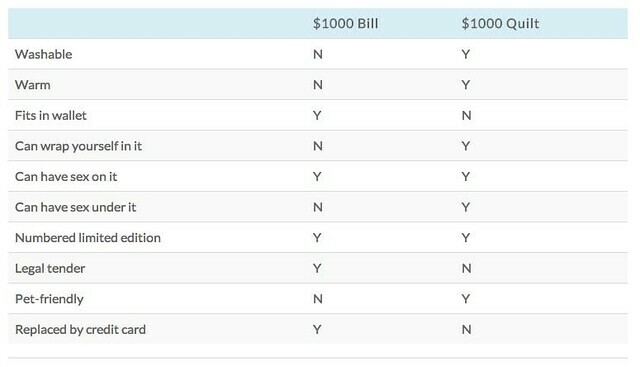 The individual bills are painstakingly bound by Nina Paley, using a hundred-year-old foot-powered treadle sewing machine. This soft and tactile bill contains over 360,000 stitches through 100% cotton fabric, lofted with quality polyester batting – the best type for this purpose, though cotton or wool can be used on request. QuiltMoney can be machine washed like any other quilt; this is known as money laundering. 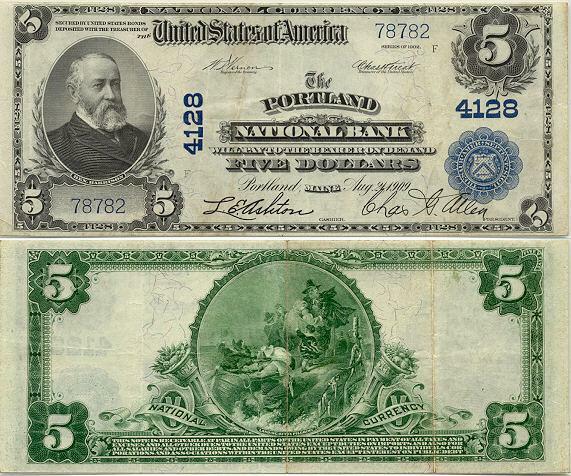 The design is based on a 1934-series $1000 bill featuring the portrait of Grover Cleveland, the only US president to serve two non-consecutive terms…Each $1000 bill is 40 inches high by 90 inches wide (3’4″ x 7’6″, or 1m x 2.3m) with bound edges. A rare uncut sheet of two is 92″ square, suitable for use on a queen or king size bed. As we cozy up with our currency, we might send rebellious birthday greetings to Mikhail Alexandrovich Bakunin; he was born on this date in 1814 (as recorded, O.S., in Russia; it is also rendered, N.S., May 30). A student of philosophy who immersed himself in Hegel, Bakunin moved to Paris, where he became first a friend, then an antagonist of Marx. 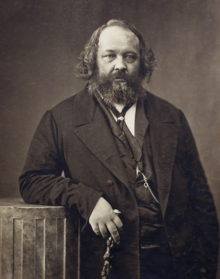 While Bakunin shared Marx’s dedication to justice for peasants and workers, he disagreed that acting through the State was the remedy. Rather, Bakunin, an anarcho-socialist, argued for the replacement of the state with federations of self-governing workplaces and communes. Their rivalry came to a climax at the 1872 Hague Congress, at which Marx and his supporters expelled Bakunin and his from the International Workingmen’s Association (IWA). Bakunin then held a rival conference, and recruited a larger faction of IWA members than Marx. In the end, of course, while Bakunin was right to predict that Marxist regimes would be one-party dictatorships over the proletariat, not of the proletariat, it was Marx’s approach that enthralled Lenin. 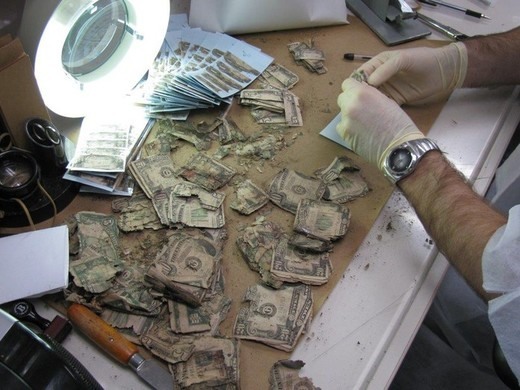 Bakunin argued that, post-collectivization, money should be replaced by labor notes, recompense for work democratically-determined according to time spent and difficulty; still, he would surely have approved of Paley’s hand-crafted currency. As we button our wallet pockets, we might recall that it was on this date in 1971 that then-President Richard Nixon declared that the official U.S. price of gold would be raised from $35 to $38 per ounce, devaluing the dollar, and effectively ending the Bretton Woods system of international financial exchange. Earlier, in August of that year, Nixon had suspended the convertibility of the dollar into gold; still, the dollar was pegged at the $35 value stipulated by Bretton Woods. In changing that value, Nixon ushered in the era of freely-floating currencies that remains to this day. 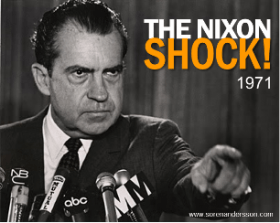 What has become known as “the Nixon shock” was a response to an overvalued dollar (a result of national debt incurred in the Vietnam War and the Great Society programs), and a subsequent move by nations (first West Germany, then Switzerland and France) to redeem their dollars for gold. U.S. gold reserves fell by half from their level a decade earlier, to $10 Billion, and the U.S. feared a “run” on that remainder. 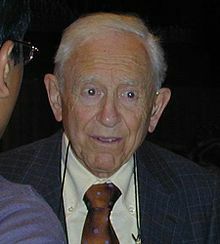 The suspension of convertibility addressed that danger, and (along with the price freeze, minimum wage guarantee, and import tariffs that accompanied it) helped both to stabilize the U.S. economy (temporarily- the period of “stagflation” was relatively soon to follow) and to bring the other developed economies to the negotiating table. 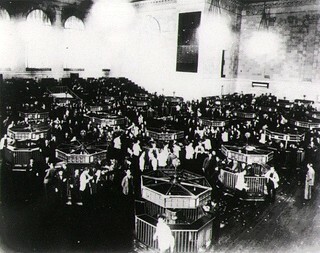 The results of that parlay, The Smithsonian Agreement, raised the “value” of the gold to $38 per ounce, eliminated convertibility as feature of the international currency regime, appreciated other currencies against the dollar, and focused efforts to balance the world financial system on special drawing rights alone.